Stunning Bridal outfits that totally took our breath away!! With changing trends every day, every bride dreams of a unique attire for her wedding. There is so much of thought process behind every perfect bridal outfit. It’s not at all an easy task to get your hands on a perfect lehenga! And, its not just about colors- there so many new silhouettes and designs that it can get a bit confusing as to what you want! So here are some unique designs that you can consider for your D-Day! 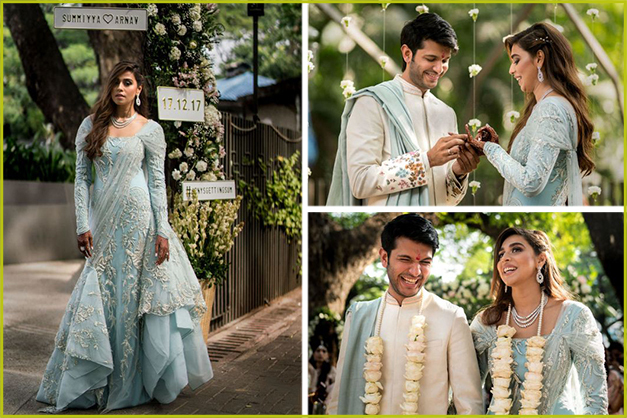 We were totally enthralled by Summiyya Patni’s choice of wedding attire. Her Gaurav Gupta ensemble was a total treat for eyes. 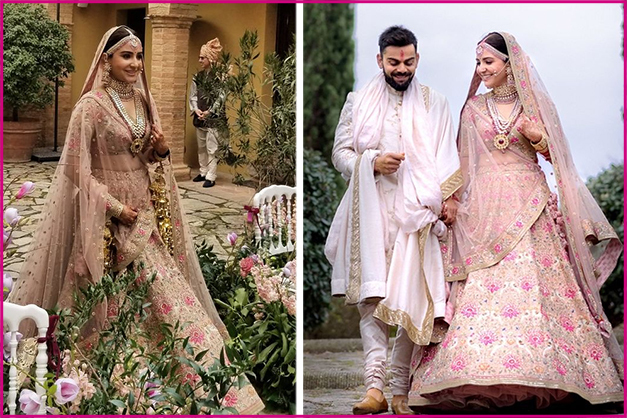 Words would be really to describe the beauty Anushka’s Sabyasachi Lehenga on her wedding. Her subtle makeup with pink attire was no less than a dream. Samantha Ruth Prabhu’s white saree had her love story engraved on it. 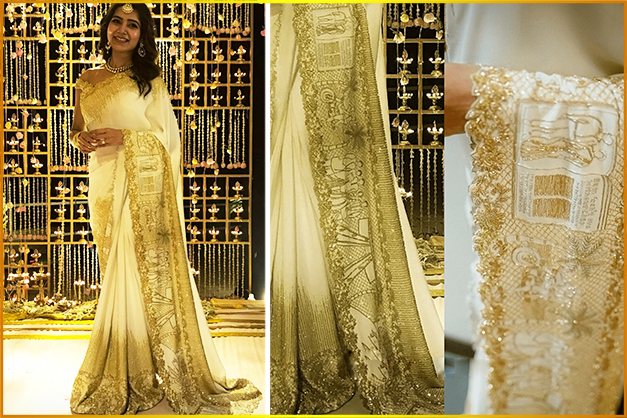 It was designed by Kresha Bajaj’s label Koëcsh with Gold beads and embroidery and that was costed almost 10 lakhs. Ex-Miss India USA, Natasha Arora’s wedding was also in headlines because of her surreal attire choices. 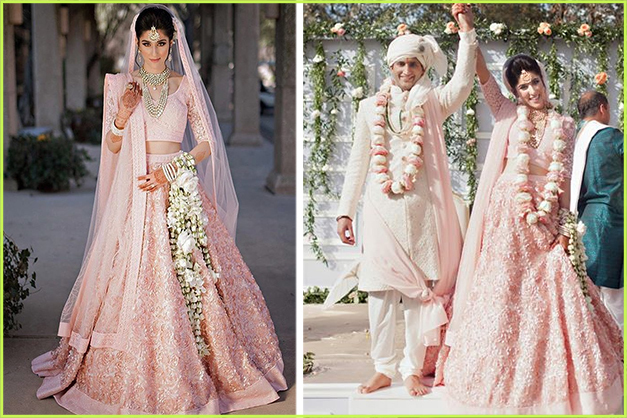 Her blush pink lehenga with leather roses and lace detail was totally astounding. The most eye catching detail of her look was her floral kaleeras that made her looked like someone out of a fairytale! 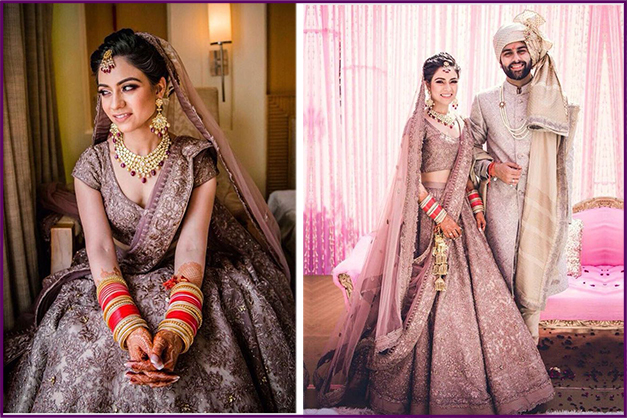 We were totally floored by Vandya’s choice of color for her lehenga. This detailed outfit by Shantanu & Nikhil in the subtle hue of lavender was a total show stealer. Also read: How to ditch Non Traditional colors on your wedding day?